This is it, the week we have been waiting for since we first heard that Captain America: Civil War would be adapted to film. In celebration, The Fangirl Initiative is getting ready by sharing our thoughts, opinions, and theories on Civil War and the Marvel Fandom in general. Welcome to Civil War Week! I am kicking things off by sharing why I, a once unlikely fan, first became a part of the Marvel Fandom. Strangely enough, the two figureheads of Civil War were a big part of that. To begin my story, we need to head back about six or seven years to my high school Anatomy class. As a 17-year-old girl, I wasn't exactly what you would call comfortable with embracing my interests and passions. I had seen at least one adaptation of the Hulk and was pretty burnt out on The Dark Knight as it was the only movie anyone really wanted to watch in 2010. At this point, I, Anna Gensimore, was a self-professed hater of super hero movies (Aside from Spider-Man, but he's always been one of my favorites). A lot of the hype seemed silly to me but that was simply because I hadn't given them a chance yet. Yes, this is from Iron Man 2, I just love this picture. Some time around mid-April, my teacher had given up on teaching us anything else. While we worked on our study guides for our final exams, he played a bunch of movies, most of which I wouldn't have watched by my own choice. This included Iron Man. Despite my apprehension, I put down my pencil and stopped looking up anatomy terms. 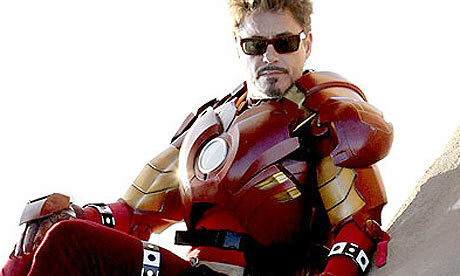 Tony Stark reminded me of the deeply flawed humanity buried beneath the super suits and extraordinary abilities. His sarcasm and bravado led me to realize what I'd missed before: the heart (or ARC reactor) of these films and the very real issues that they deal with. This only continued with the films that followed. The first time I saw The Avengers, and every time really, his kindness and respect toward Dr. Banner gives me the warm fuzzies. Science Bros is probably my favorite thing to come out of the Marvel fandom. Seeing Tony intentionally try to make him comfortable and feel cared for was a huge marker of his growth. Tony Stark's evolution as a character is an important one, and I would be sorely wrong to not credit him with helping me begin to see just how important the MCU is as a commentary on events in our time. Tony Stark's brand of sass kindled a spark in my heart that would be fully ignited in the fall of 2011 when a group of friends went to see Captain America: The First Avenger at the local dollar theater. To begin with, I loved the aesthetic of the film. The World War II era has always been one of my favorites style and decor wise. I also really liked how The First Avenger handled propaganda and nationalism without too much cynicism. Something about Cap as a character struck me deep; he was an ordinary person who became something greater. Not out of a desire to be more powerful or to earn his place in the world but for the right reasons. Steve Rogers became Captain America simply because it was the only way he knew how to do things. From the moment he jumped on top of that grenade, Steve Rogers claimed a piece of my heart like the loyal Golden Retriever that he personifies fetching a stick. Captain America made me care about a superhero in ways I hadn't imagined possible. (I could write a novel about his loyalty to Bucky.) He's like the friend that gives you life advice as well as a kick in the pants when you need one. Everyone needs a Steve in their life, and I'm lucky to have one. The First Avenger left me in disbelief that I hadn't come to love this method of storytelling much sooner. He's beauty, he's grace, he'll smash your face. Before The Avengers, the Hulk really wasn't my favorite. Probably because of previous film adaptations and how pop culture has skewed the character in the past. Maybe it was nostalgia from his role as Matty Flamhaff in 13 Going on 30, but something told me to give Mark Ruffalo's Hulk a chance. The result was eventually me crying while reading the Planet Hulk comics in the middle of Books-a-Million. In The Avengers, we find the dear doctor providing medical care in an abandoned corner of the world. He feels plagued by what he's done as "The Other Guy" and has a desire to help others in any way possible. Considering he gained his other personality through committing an act of kindness in the first place, this makes total sense. Bruce Banner has been through a lot, but overall, he still believes in the goodness of humanity and its potential for redemption. He has a heart of gold despite his struggles, he is way too hard on himself, and he is actively discriminated against. Yes, I understand that the Hulk is dangerous, but the man underneath is so much more. Bruce Banner helped me recognize my own anxiety and reminded me even more of the beautiful complexity of humanity. Despite our downfalls, mistakes, and selfishness, we are, at our heart, good. This is one of the many reasons why I actually loved the HulkxWidow story line in Age of Ultron. I saw so much of myself and my Dear One in it as well as the simple audacity of hope. If we dare be optimistic, something beautiful can happen in pretty much any given situation. Idealism isn't a bad thing. I would love to see this pairing work out in the long run if things were to calm down a bit. They are both extremely independent people that work well together as a team. The pairing recognizes that two deeply flawed people, who know they are strong on their own and fully capable of functioning separately, need reminded of the beauty of loving someone into being their best self (whatever that comes to mean). The MCU is in its heart a story about the human condition. Story lines and characters evolve with the times, but we are never left without a reminder of who we once were or a glimpse of the hope of what we will become. I fell in love with characters, not their superpowers (although those are pretty frigging cool). My love for characters doesn't stop here; if I wrote about every character from the MCU and comics that I care about...let's just say we'd be here for a while. So my advice to all of you who are undecided on the whole "superhero thing": watch a few phase one and two films, don't be afraid to cry, watch Civil War and probably cry a lot. Read the comics, embrace the richness of the story, and don't be afraid to be passionate. What character(s) made you get interested in the MCU or the comics? What was it about them that made you stop and think? Awesome article :) I love the Marvel Universe, but sometimes I admit it with something like shame—as if I shouldn't care that much about a bunch of 'silly superhero movies.' But I entirely agree with your assessment of their value. Sure, they aren't likely to be recognized 100 years from now as pieces of subtle artistic brilliance, but in their own way they hit deep. Bonus points for loving the Bruce/Natasha pairing—I was rather surprised at how many people disliked it, because I absolutely loved that element of the story.